Surface excess amount of adsorbed substance (Gibbs adsorption), ( ) is the excess of the amount of component actually present in the interfacial layer over that which would be present at the same equilibrium gas pressure in the reference system, in which the gas phase concentration is constant up to the Gibbs surface, and the reference concentration of component is zero beyond the Gibbs surface in the surface layer of the solid (see Figure 2). where the interfacial layer is divided into two regions, the adsorption space and surface layer of the solid (see §1.1.5), by the Gibbs surface. The second term is usually assumed to be zero or negligible. Similar definitions can be given for the surface excess number of molecules of component , , and of the surface excess mass of , , and of the surface excess volume of gas of ( ) preferably expressed as the volume of gas calculated for 273.15 and 101.325 (0 and 1 atm): the equation of state used in the calculation should be stated. where is the total amount of component present and is the volume of the gas defined by the Gibbs dividing surface. 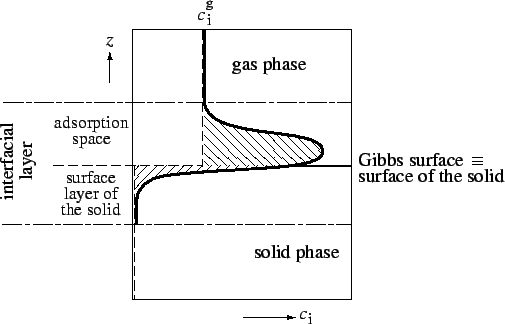 The position of the Gibbs surface is often defined experimentally as that surface which encloses the volume of space from which the solid excludes helium gas (the so-called helium dead-space), and is associated with the assumptions that the volume of the solid is unaffected by the adsorption of , and that helium is not adsorbed by the solid. This requires that the measurement of the helium dead-space be made at a sufficiently high temperature. Figure 2: Schematic representation of the concentration profile ( ) as a function of distance ( ) normal to the surface: full line--in the real system; broken line--in the reference system; chain-dotted line--boundaries of the interfacial layer. The excess amount of adsorbed substance per unit area ( ) is given by the sum of the areas of the two shaded portions. This last identification is usually justified in measurements of gas adsorption at lower pressures. Under these conditions the surface excess amount of adsorbed substance and the amount of adsorbed substance become indistinguishable and the latter term (often abbreviated to amount adsorbed) is usually used for both concepts. The following definitions refer to the adsorption of a single adsorptive. Adsorption isobar is the function relating the amount, mass, or volume, or corresponding excess of substance adsorbed by a given amount of solid to the temperature at constant pressure. Adsorption isostere is the function relating the equilibrium pressure to the temperature at a constant value of the amount, or excess amount, of substance adsorbed by a given amount of solid. In the case of microporous solids the interpretation of adsorption measurements in terms of surface area may lose its significance when the size of the adsorbed molecules is comparable with the dimensions of the pores. Nevertheless it may be convenient to define a monolayer equivalent area, in which is replaced in the above equation by the amount needed to fill the micropores (§1.1.7).